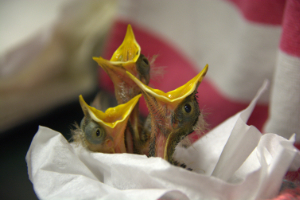 The Wild Bird Care Centre does not receive ongoing operating funding from any level of government and could not operate without the hard work of our amazing volunteers and generous contributions from rescuers, visitors and other caring individuals like yourself. Having regular donation means the Centre has a predictable income each month, which helps us budget and plan for our busier times of the year. You can sign up using PayPal or Stripe payment gateways (select monthly on checkout), or send us a completed printable form by mail, attaching a VOID cheque*. Where small donations really add up! Thank you so much for supporting our cause and aiding in the treatment, rehabilitation and care of the many injured, ill or orphaned wild birds that we help each year. Registered Charitable Business #89340 1380 RR0002. Tax receipts are issued automatically for online donations. For off-line donations, tax receipts are issued only for donations of $20 or more.